Recent disasters like the Rana Plaza fire in Bangladesh have created awareness about unsafe working conditions in the overseas fashion industry. What most people don’t know is that a pervasive lack of concern about workers isn’t new for clothing manufacturers. Over one hundred years ago, a large fire engulfed a clothing factory in New York City killing 146 workers, most of whom were immigrant women. The incidence spurred reform of building, fire, and safety codes around the United States, which was a positive change until we started shipping all of our garment industry jobs overseas. 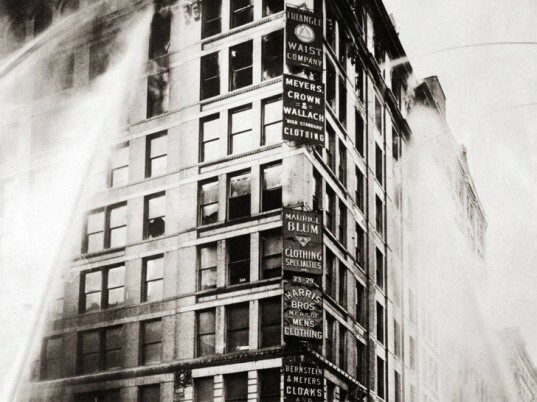 A group of leading human rights and labor reform scholars and activists on the 103rd anniversary of the Triangle Shirtwaist Factory Fire to discuss the history and the potential reforms that can come out of the Fire’s legacy. Follow the link to read our in-depth coverage of the event.